Sports participation results in 70 percent of anterior cruciate ligament (ACL) tears and the majority of these occur in 15 to 45 year olds. Approximately 70 percent of ACL injuries are noncontact injuries that occur during a sudden change in direction with a planted foot (i.e., cutting) or stopping rapidly. In the United States there are between 100,000 to 250,000 ACL ruptures annually. The ACL is one of the main stabilizing ligaments of the knee and helps provide the hinge that allows the knee to remain stable while moving. When an ACL tear occurs the athlete often reports hearing a pop and usually cannot walk on the injured limb. During the injury it is common for the knee to partially dislocate, resulting in bruising and sometimes a small fracture at the back of the tibia and on the femur. Also common is a sprain of the medial collateral ligament (MCL) which is located on the inside of the knee. These injuries result in a painful swollen knee that is tender outside and deep within the knee. Female athletes are two to eight times more likely to rupture their ACL than male athletes. This is primarily due to mechanical reasons, such as weaker core muscles and hamstrings. Another factor that can increase the risk of ligament rupture is the interface between the player’s shoes and the playing surface that results in higher friction. For example, longer cleats or more cleats on a shoe resulting in better traction and more friction. High risk sports include soccer, basketball, volleyball, skiing, and football. Prevention programs have been developed based on analyzing the mechanism of injury of ACL ruptures as well as the kinematics of female body position during landing and cutting compared to males. The goal of these programs is to train the athlete to keep her center of gravity forward and on her toes, as well as encourage better leg rotation and control. 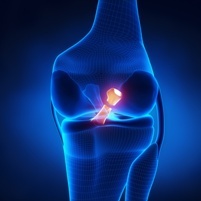 These programs may reduce the incidence of ACL rupture by up to 50 percent. Typically a prevention training protocol should be done at least 2 to 3 times a week and last 15–20 minutes. As an added bonus these programs often improve an athlete’s performance such as jump height and speed. Speak with your sports medicine professional about exercises and programs to help prevent ACL injuries. Athletes and patients with a reconstructed ACL often ask if bracing can prevent ACL injuries. Currently there is no evidence that knee braces can prevent an ACL rupture and many orthopaedic surgeons do not routinely use them..